Scientists are set to explore the world's deepest undersea volcanoes, which lie 6km down in the Caribbean. 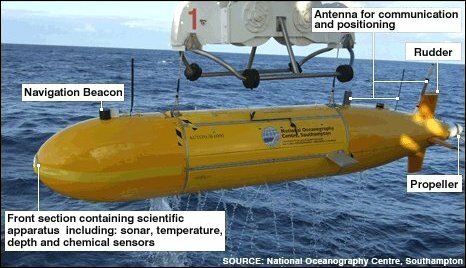 Delving into uncharted waters to hunt for volcanic vents will be Autosub6000, Britain's new autonomously controlled, robot submarine. 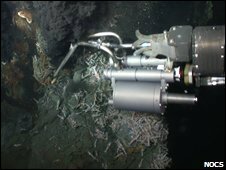 Once found, the life, gas and sediment around the vents - the world's hottest - will be sampled and catalogued. The research will be carried out by a British team aboard the UK's latest research ship, the James Cook. "We are heading out on two expeditions, each close to a month long, to map the full length of the Cayman Trough," said team leader, Dr Jon Copley of the National Oceanography Centre in Southampton (NOCS). 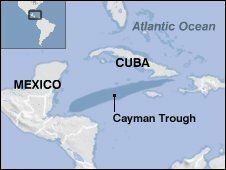 Dr Copley explained that the Cayman Trough, which lies between Jamaica and the Cayman Islands, is a product of the Caribbean tectonic plate pulling away from the American plate. "It is the world's deepest volcanic ridge and totally unexplored," the Southampton-based researcher told BBC News. Along with Autosub6000, the researchers will also rely on Isis, the UK's deepest-diving, remotely operated vehicle to scan the deep. First overboard will be Autosub6000, an unmanned undersea vehicle that can go down to 6,000m and carry out a dive without being controlled from the surface. It will be tasked with finding the volcanic vents on the ocean floor. The second submarine to take the plunge will be the Isis. Isis will sample fluids and sediments from around the lip of the vents to test their geochemistry, and also collect animal specimens. "We are hoping to find several different types of vents along the ridge," said Dr Copley. "Some of the vents will be very similar in depth to the vents we already know about, and because the conditions will be alike, we might expect very similar animals," he explained. The researchers will look to compare the animals around the Cayman vents with those in the Atlantic and Pacific, in the hope of better understanding the processes that affect how deep-sea creatures "get about". If the organisms in the Cayman Trough look like those from other deep volcanic trenches, it will suggest that ocean currents must play a role in shaping the patterns of deep-sea life by transporting the animals' larvae around. However, if the Cayman Trough animals are very different from those existing in other parts of the Earth's oceans then isolation will be considered more important. "The deep ocean is our planet's largest ecosystem. If we are going to use its resources responsibly then we need understand what determines its patterns of life," the Southampton-based researcher said. Dr Copley told BBC News that there was also another kind of venting that was driven by a very different geological process in which the Earth's mantle is directly exposed to the water. This type of volcanism has only ever been seen once before, in the mid-Atlantic. The temperatures around these hydrothermal vents were so hot because they were so deep, Dr Copley said. "They could be hotter than 500C (930F), and if they are that hot, they will probably have quite different chemistry and life forms - we expect to find new species." The researchers expect that, at depths greater than 3,000m, one in every two animals they come across will be a species new to science.